Sunday, April 22nd Salem Baptist Association held Children’s Bible Drill competitions at Salem Baptist Church in Liberty, TN. 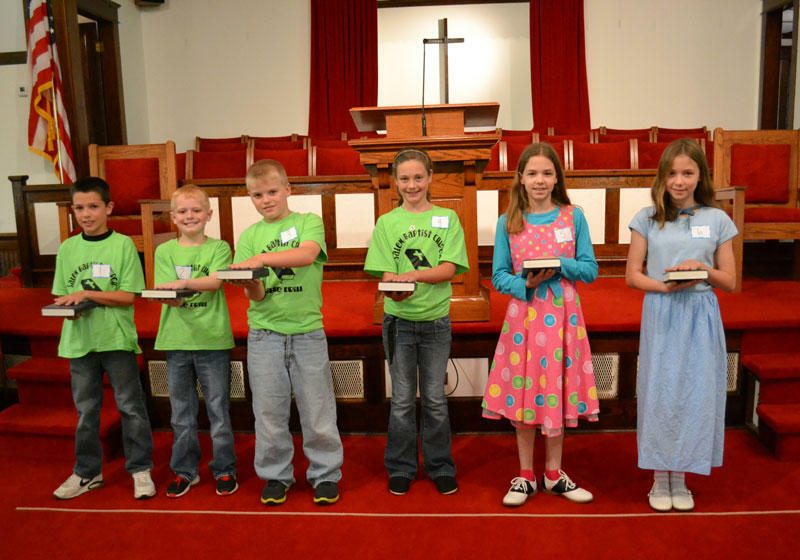 There were six children competing who advanced to the regional Bible drill contest held on Saturday, April 28, in Cookeville. The girls and two boys placed superior. Hannah Denninger received a trophy as three-year State Bible Drill participant. Pictured above (L to R): Noah Roberts, Kelsey Wade, Elijah Foutch, and Lydia Brown, from Salem and Hannah and Erilyn Denninger from Auburn Baptist Church, Auburntown. Younger youth participating in the Salem Association Bible Drill are (L to R) Madison Martin of Salem Baptist Church, Liberty, Alena Denninger, Kiley Hughes, Caitlyn Crook, Carly Brown, Brenden Reed and William and Christian Denninger of Auburn Baptist Church, Auburntown.